What are the differences between anesthesias for 1 hour verses 4-8 hours? A. 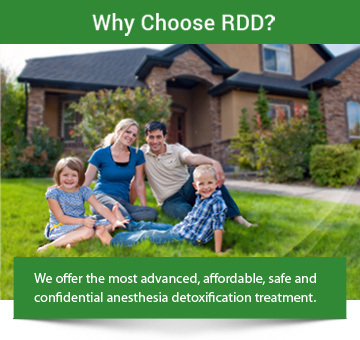 The RDD Method™ of Anesthesia Detoxification takes just 1 hour which is far safer than being under anesthesia for 4-8 hours. Lengthy anesthesia is absolutely unnecessary for this procedure. Cases longer than 4 hours have a higher risk of complications. After 4 hours the risk of anesthesia itself becomes a factor independent of the anesthesiologist. Complications to the lungs, circulatory system and chance of blood clots increase to a point where the doctor must weigh the risks and benefits carefully. Q. What makes anesthesia detox safe? A number of factors contribute to the overall safety of anesthesia for the rapid detoxification procedure. These include: admittance to a surgical facility, experienced and knowledgeable “Board Certified” physicians present for the detox procedure, the short duration of the actual amount of time under anesthesia, access to proper medications and equipment used in the Operating Room, and overall expert medical care and continued monitoring that patients receive in an O.R. For example, the anesthesiologist is responsible for your overall health and safety from the start of your anesthesia detox treatment until you leave the Operating Room to be transferred to the recovery room. The anesthesiologist makes certain that all the anesthesia equipment is working properly before you undergo anesthesia. 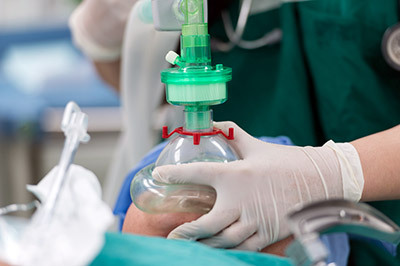 The anesthesiologist is trained on what measures to take if a problem occurs. The anesthesiologist is with you throughout your detoxification treatment watching and monitoring you carefully. The anesthesiologist also continuously watches a number of monitors while in the O.R. to ensure your safety while you are being detoxed under anesthesia. Should there be any complications, your anesthesiologist responds quickly, having been fully trained in managing emergencies. This is why it is necessary to have knowledgeable medical staff along with all the modern state-of-the-art equipment readily available in a modern Operating Room that only a facility can provide.